One of the six major regional IGP areas for the production of land wines in France, The other five are Atlantique. Comtés of Rhodania. Comté Tolosan. Méditerranée and Pays d'Oc, It covers the entire winegrowing region Loire along the river and ten tributaries. The former Vin de pays area was known as the Jardin de la France until 2007, in German "Garden of France" and referred to the scenic area along the river with the many picturesque Loire castles. The vineyards cover about 70,000 hectares of vineyards. There are over 30 AOC areas in this large area. 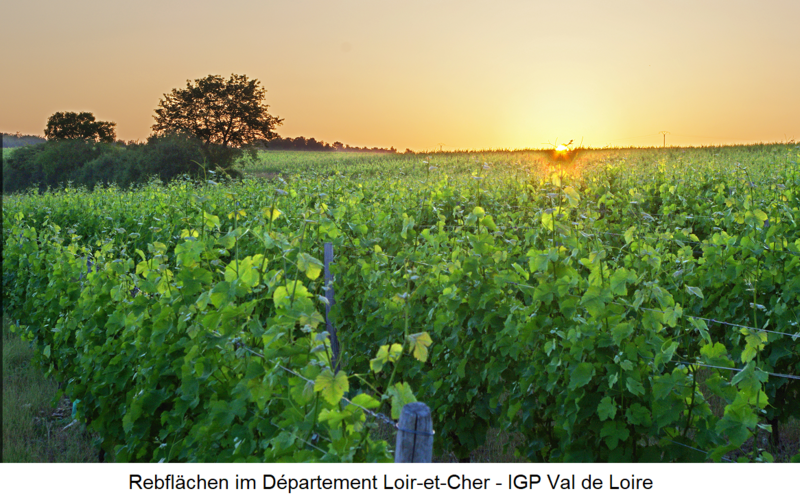 The IGP designation Val de Loire can be supplemented by the names of the 14 départements, which correspond to narrower, geographical names. These are Allier Cher, Indre, Indre-et-Loire, Loire et-Cher, Loire-Atlantique, Loire, Maine-et-Loire, Marches de Bretagne, Nièvre, Pays de Retz, Sarthe, Vendée and Vienne. Other independent IGP areas are Coteaux de Tannay and Coteaux du Cher et de l'Arnon. This page was last modified at 3 May 2018 at 06:49.